One of the first things you should learn when you begin working with crystals is how to cleanse crystals. This is not physical cleaning I am talking about but how to energetically cleanse them. Crystals are sensitive tools which absorb energies as well as emit them. If you have never cleansed your crystals before don’t worry, you’re not the only one. Cleansing crystals can seem intimidating to some people or even complicated but it’s really not once you get started. Crystals pick up all kinds of energies from our thoughts, feelings, other people and places. Sometimes these energies are not in alignment with the crystal’s higher purpose, they may even be negative or can simply clog the crystal weakening its properties. If you use a crystal for chakra healing for example it can take on energies which you would not want to keep or pass onto others. If you have purchased or been given new crystals, you should always cleanse them before you use them. Also if someone else handles your crystals it is a good idea to cleanse them too. There are many methods available which you can use to cleanse your crystals and bring them back into balance. Some methods you may come across online and in books can actually damage your crystals (I know because I’ve learned the hard way). I do not recommend you use water, salt or the Sun. So I am going to be sharing with you only those which I have used and know to be perfectly safe for your crystals. Some of these methods are well known but some you may not have heard of before. Whatever method you choose remember it’s all about your intention. Focus on energetically cleansing your crystal as you do it. This popular Native American cleansing method uses dried White Sage bundles which can be purchased at most metaphysical shops or websites. You will need a dish to catch any ashes or cinders. You could use a large Abalone Shell which is traditional in some tribes. Light the Smudge Stick then blow out any flame. You can now pass your crystal through the smoke a few times to clear it. Carefully stub out the Smudge Stick in the dish. Alternativly burn part of a stick of Palo Santo wood, use the smoke in the same way. At night when the Moon is full place your crystals on a window sill which faces the Moon. If it is safe to do so and dry you could also leave them outside. Use a glass jar or bowl to cover them for extra protection if needed. The moonlight will cleanse the crystals overnight. Remember to remove them first thing in the morning so they don’t get too much direct sunlight which can fade them over time. For a detailed look at this method please read How To Cleanse Crystals By The Full Moon. If you are a Reiki practitioner or use any other energy healing method you can use this to cleanse your crystals whenever or wherever you are. Simply hold your crystals and pass the healing energy through them. These days you can learn many healing modalities online through Home study courses. These Buddhist metal bowls come with a cushion to rest them on and a wooden stick. When struck they emit a tone which is both soothing and cleansing. You do not need a big one, there are some beautiful handmade ones on Amazon like this simple one. Or this one engraved with mantras. Don’t put your crystals inside the bowl itself (It may damage them) but place them outside, around it. Gently strike the side with the stick and slowly rub the rim or outer edge of the Singing Bowl in a clockwise direction several times. Not very well known but one of the simplest methods to use. You can find these online and they are made of copper pipes or rods. Look for ones based on the proportions of the Great Pyramid to tap into powerful Sacred Geometry. Remember that really small ones will only be good for smaller crystals. Use a compass so that you always have all four sides facing the four cardinal directions. Simply leave your crystals in the pyramid for an hour or longer if you wish. To learn more about these energy tools and how to use them, please read my article Cleansing Crystals with a Copper Pyramid. But Can’t I Just Use Water? You may be wondering why I don’t recommend using water to cleanse crystals. This is one of the methods which can damage certain minerals. To learn more about the potential dangers of using water with your crystals check out my blog post: Why I NEVER Cleanse Crystals in Water. Will Cleansing Remove The Good Stuff? Cleansing crystals will not remove any good energies from your stones. All you are removing is energies that do not belong there or are clogging up your crystal and stopping it from working at optimal level. Cleansing crystals will not remove any pragrams you have placed inside your crystals unless that is your intention. That is called deprogramming and is not the same thing as cleansing. These are just a few methods you can use. In time you will likely develop your own ways. After cleansing the crystals will feel revitalised and renewed as well as work at their full potential. If you know people who may benefit from this post please share the link with them or use one of the sharing buttons below. I would love to know what ways you use to cleanse your crystals? Let me know in the comments below (Please keep any questions you have on topic if you want a response). Great information, thanks Ethan. I have used 1 of these methods – moonlight – but now I know to use Reiki as I’m attuned to Reiki and my new Tibetan Singing Bowl! 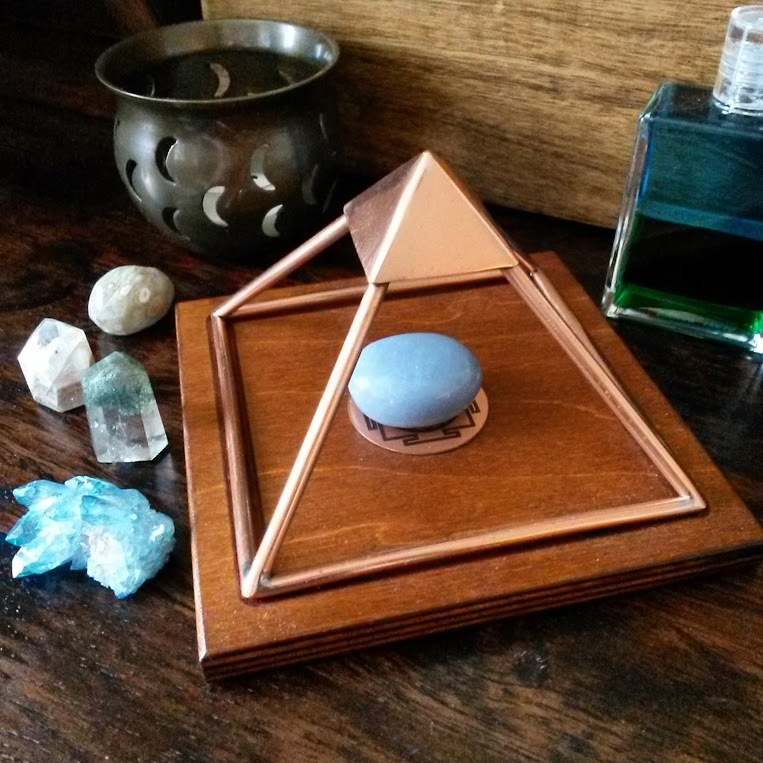 I almost have a copper pyramid = well, I have a crystal pyramid quartz with copper coils projecting from out to the four directions. This article has really helped me alot, I am going to share it. Yay you got a Singing Bowl! In my opinion one of the most useful spiritual tools you can invest in. I use mine all the time. They clear and balance the chakras too. If thats your bowl in the video, it is really beautiful. I have been thinking of getting a new one as mine is small (Had it for 15 years) and like the use of mantras on some of the ones you can get now. Hello Ethan, I’ve learned so much reading your articles and two of your books (which I must admit I speed-read and need to go back over to truly absorb them). I’m intrigued by your comments on Singing Bowls and have searched your site for more information. Are uses as spiritual tools something you might explore in an article, or could you direct me to a resource? My mother gifted me with a Singing Bowl years ago, it has been cherished but now I am making use of it to clean my crystals. So helpful as I am sensitive to sage and smoke in general. I haven’t done an in-depth guide on my blog yet, hopefully at some point. I do cover their use to cleanse your home and any items in more detail in my book Psychic Protection Crystals. I will order that book, thank you. HI. I have a few crystals, and was trying to figure out exactly what my large crystal is (for what is considered the main healing properties of this crystal) and how to cleanse some of my crystals. I asked on a forum about it and someone told me that my large crystal was something she calls a phantom crystal, and I think I found the type she meant. I think it’s a lot like the Amphibole Angel Phantom Quartz. It’s not like the phantom crystal that you describe on the formation page. It also has a lot of fractures. She said she cleanses hers by putting them in a leather pouch and burying them in the ground for a day or two, then putting them in the full moon, which she recommended for me to do both. But then she also said they are sensitive to temperature, and since its summer, it’s getting in the 90’s during the day where I live. You don’t mention burying them here. Is burying them something you would do? Is there a negative to that? I’ve heard of burying crystals before. im just not sure that it’s a good way to go for cleansing with the temperature changes where I live. Yes the phantom in Angel Phantom Quartz is very unusual looking and there are all kinds of phantoms which may look different to the basic phantom formation. I know some people bury their crystals to cleanse them but it is a lot of work to me. My main issue with burying is keeping things dry and clean. I would use a secure glass large jar. It is up to you but there are so many simple and effective methods to try. There is no one right way to cleanse. This information has been super helpful for me thank you. I’ve always had a love of crystals but have only recently started getting into them seriously. I’m just wondering how often the crystals should be cleansed? Thanks for your comment. Opinions do vary on this so see what feels right for you. I personally cleanse any crystal I have carried, worn or placed on a chakra that day. With crystals that are on display, maybe once a month with a Singing Bowl as thats easiest. I may write an article on this at some time for more detail. I think some crystals do cleanse themselves an can cleanse other stones but I just think it makes more sense to cleanse all of them just to be sure and to keep things simple. The Copper Pyramid is a bit of an investment if your new. If you are okay with it you can hold your crystals and visualise divine white light coming in from the top of your head down to your heart and out your hands filling the crystals. After a minute or two your crystals are cleansed. Hi! Very useful article, thanks 🙂 I’m just learning about crystals and I’m about to buy some tomorrow (I saw your article on basic crystals!) because I want to take advantage of the full moon from the next few days to cleanse them. And also because my city is very cloudy so you can barely see the moon, and I’m gonna be travelling to a beach where the sky is really clear. And coincidently I’ll be there for the supermoon on november 14th! So I was wondering if the supermoon has any additional effects on crystals or is it just the same? Also, do you have any recommendations for what size and shape should my crystals have? Considering I’m just getting started. Thanks!! Hey Angela, that sounds amazing. Yes I do believe that a Supermoon is even more powerful but any Full Moon will clear your crystals. I will go into size and shape on here at some point soon but just for beginners I think small to medium sized Tumble Stones are perfect. If you want some small natural crystal points of Quartz or Amethyst that is also good. No need to spend a fortune or buy rare stones when your just starting to build a relationship with crystals. what exactly is that beautiful blue stone outside the copper pyramid in your picture? Its gorgeous!! Thank you so much for this article. I am just getting started with crystals myself and have been washing them in the ocean!! I look forward to reading/learning more from you! Hi Cheri, glad to be of help and yes sea water is not the best thing to use. The blue crystal is an Aqua Aura Cluster. Hello. Thank you for the informative article. I often use sage or moonlight to cleanse my crystals. I have however had a difficult time finding any information about cleansing ruby fuschite. I have a necklace that absorbed some oils from my natural moisturizer and have yet to find anything about how to cleanse the ruby fuschite stone. Any tips? Thank you! Hi April, thanks for your comment. I personally do not use different cleansing methods for different crystals. If you feel guided to use a different method for certain stones, then follow your intuition. Neither of the two methods you mentioned is harmful for that stone in my opinion. I do not know of a way to remove oils from a stone but remember that is going to be a common thing when people wear crystal jewellery. Crystals also absorb natural oils from our skin and it will deepen the colour. There is no way to stop this. I was into it until you said not to use water. .. you know crystals grow outside, right? I’ve gone rock hunting and found them myself. Water is not going to harm your crystals. Every crystal you’ve encountered has been washed in water. And possibly chemicals. Certain crystals like the Quartz family of minerals are safe in water but some are not. This is to do with science, minerology and hardness of crystals. I have had my own crystals damaged by water. You can read my article about water for more detail or speak to a minerologist Why I never cleanse crystals in water. Thank you, Ethan so much for all your valuable information it’s really hard when your starting out. The web is filled with so many different ways and it can become very overwhelming. My question: When I get a new Crystal I smudge it with White Sage and sometimes with both White Sage and Pablo Santo. I also bought a pointed Selenite flat bed and I place my Crystals their to cleanse them every time I use them. Is cleansing with Selenite on a regular basis ok. As you mentioned you cleanse your Crystals after each use. I also want to Thank you again for all your help. I feel like I do not need to check the web anymore for questions and information. Checking for information on your site it’s all I need.. I emailed you once with a question on a Crystal and you answered right away with a very clear understanding answer. It was was very comforting and felt right. I hope you don’t mine but you will probably be getting more emails from me from time to time with questions. Thank you Mercy. I know a few people that use Selenite to cleanse other crystals and feel it works well for them. I just have not used this method so thats why I do not mention it. Selenite is one of the most cleansing crystals but I cleanse all my crystals including Selenite and other crystals said to be self clearing. I wonder if cleansing the Selenite plate from time to time would be a good idea. Thank you. I will clean my Selenite crystals from time to time with white sage and palo santo. Will try to do so every week or two. Does that sound like a good idea? I really want to explore crystals. I received a set for Christmas. Should they be cleansed before using? Hello Ethan, can you clean them also with voice toning or tingsha bell? And if you can is it possible for it to be the only cleasing method you us? Ethan, I was advised to place my crystals in salt and cover them for about 24 hours. Is this something you would recommend? 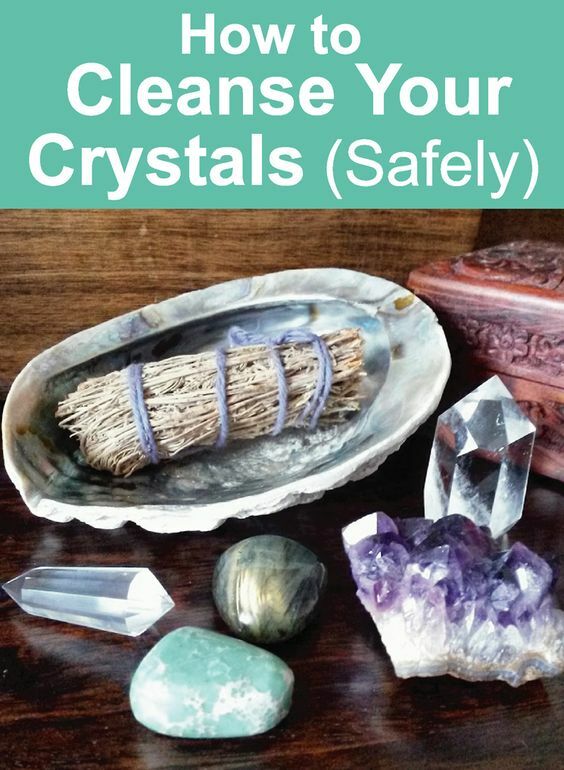 Hi Shirley, it is not listed here because it is not a very safe way to cleanse crystals. Salt can be corrosive to some stones. I cleansed my Turquoise stone with water and it has spoiled it. Ethan, what are your thoughts on placing the crystals on an Earthing Mat for cleansing. since the mat gives off the same frequencies as our Earth? Easier to do than putting in winter Canadian ground. Another thought for your opinion is using a copper wire wrapped around the crystal and the other end of the wire put through a window and dug into the ground. I use the copper wire this way with one of my indoor plants over the winter. Hi Dot. I haven’t personally used the earthing mat or copper grounding wire to cleanse crystals but both sound like they could work well to me. Tangerine Quartz usually has a Iron oxide on the surface. Water + Iron is not a great combination so I would not recommend it. Losing the surface coating would not surprise me but I would not have expected it to completely dissolve even with natural detergent. It is entirely possible that you had a fake crystal but cant be sure. Sorry to hear this happened. At the advice of another individual, I have used tepid water and sunlight on some rose quartz. Does this mean they are permanently damaged? Is it possible to revive them? Is it okay to cleanse crystals daily, say by the sage smudging method? I discover this site just recently, but I love it! the accuracy of the information are delightful and is really easy-reading. being a cristallotherapist myself, I love reading about other people’s experiences as I find it one of the most amazing way to improve! I want to suggest also another method that I find really nice, that I call the “reverse method”. you simply put your crystals in a jar, close tight the lead, and then put the jar in a bowl of salt or earth (even water if the jar is completely waterproof) for 24h. begin pagan, I follow the wheel of the year, and during imbolc I performe a deeply cleanse of all my tools, also crystals ^^. Thank you for this info, so surprising about the water, as most people recommend placing them under running water as a quick cleanse, but also “before” cleansing them! I wanted to ask you, as I have asthma and cannot burn sage, would it work as well with incense, and does it have to be sage or can it be anything else, as I cannot find it where I live. Last, yesterday I watched a video that recommended all your methods, but also putting them in a glass bowl filled with brown rice and leaving them overnight. Do you know of this method? Again Ethan, thank you so much for your blog and posts. Hi Marta, yes you can use incense but check it is natural and not just a fragrance. Any cleansing herbs can be used like Frankincense, Sage, Copal or Sandalwood. You should burn this outside to avoid the smoke or by an open window. If not stick to other methods. You can use brown rice but I would not want to reuse the rice, which means throwing it away and some people might not like to do that, plus it could be an issue if you have lots of crystals like me. Thank you so much Ethan! So kind and generous of you! I had a Rolfing friend who cleansed his crystals by putting them on top of his large amethyst geode. Do you think this is an okay method? The reason I personally don’t use this method is that the Amethyst will need cleansing itself. If you do that afterwards then why bother using the Amethyst to cleanse the crystal? It becomes two jobs, when these other methods are once only. Thank you for sharing this information. This has definite potential for me in my work with crystals. I do have a question though. This may be a silly question, but I’m only at the beginning of understanding crystal healing, a journey filled with knowledge. Do different crystals have designated cleansing rituals that only work for a specific crystal. 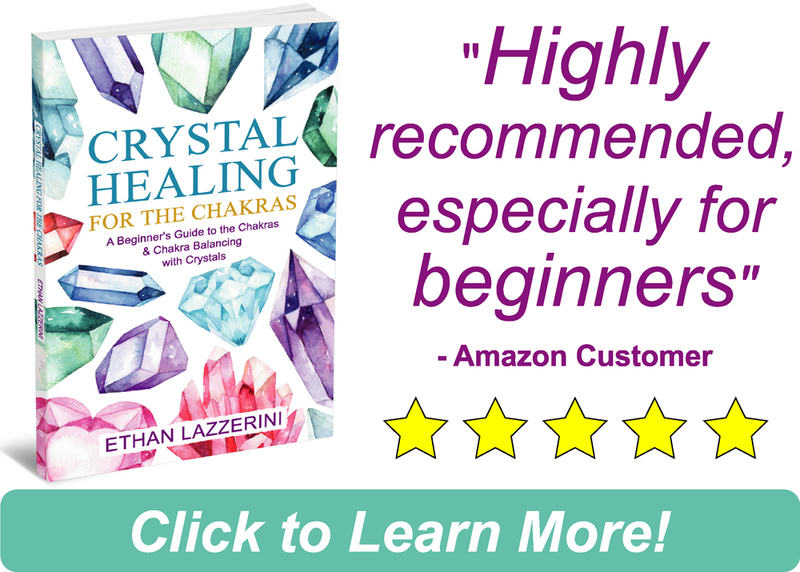 Now, what I would assume would be that you can use any type of cleansing ritual on any crystal, but each crystal has a preferred and designated routine. I’m not quite sure which proposal is accurate yet, but I will further continue my research. Thank you again for sharing this information and thank you for reading this question. Hi Trinity, I personally use my prefered method/s to cleanse all my crystals and it works for me. I feel cleansing is cleansing and so I teach people to use the method that they feel comfortable with and will actually use. Some people do use different methods for different stones but deciding which method and why could be tricky, plus will make cleansing lots of stones a lot more work. It’s up to you. I am a big fan of selenite, towers, tumbled and wands. I have been growing my collection as I am so drawn to them and dream about them. I have them in a glass cabinet now for display and my go to for daily stuff. Coming across a crystal healer and another crystal cavern, he and they both suggested using selenite to cleanse. I have been cleansing the selenite on occasion with either a smudge or white sage incense even though I know they are self cleanses (outside of course) and when I do I cleanse my other crystals but do them in groups enveloping them in smoke and saying a little affirmation of removing all negative energies absorbed. Is this okay? My collection is growing so fast, I’m wearing them and can’t get enough of them. Also, I have found a disc which is made with all cleansing materials in a disc, are these okay as I thinking about buying one? Thanks for the feedback, you are welcome. Yes I personally like to cleanse Selenite, although I agree that it is a deeply cleansing stone, I think it needs help. Smudging is effective but sound may be easier as your collection grows (Singing Bowl/Tingshas). I havent used the disc you mention, so cant really say. Hope you are getting a better night sleep. my display go to cabinet. And Thank You for all your help and guidance. Yes, it cleanses your whole house and all items and crystals you have as sound vibration penetrates every object in each room as you walk around with it. Thanks for the great article Ethan! I’m wondering if you’ve ever tried using vocal toning to cleanse crystals? I haven’t tried it yet but I discovered it in this article (https://cosmiccuts.com/blogs/healing-stones-blog/clearing-and-charging-crystals) and I love the idea of it! No, I have not used this method. There are a lot of sacred sound methods that can be used. Hi Ethan still learning from your blogs they are so helpful I’ve now read your book psychic protection crystals and it’s been a great help. 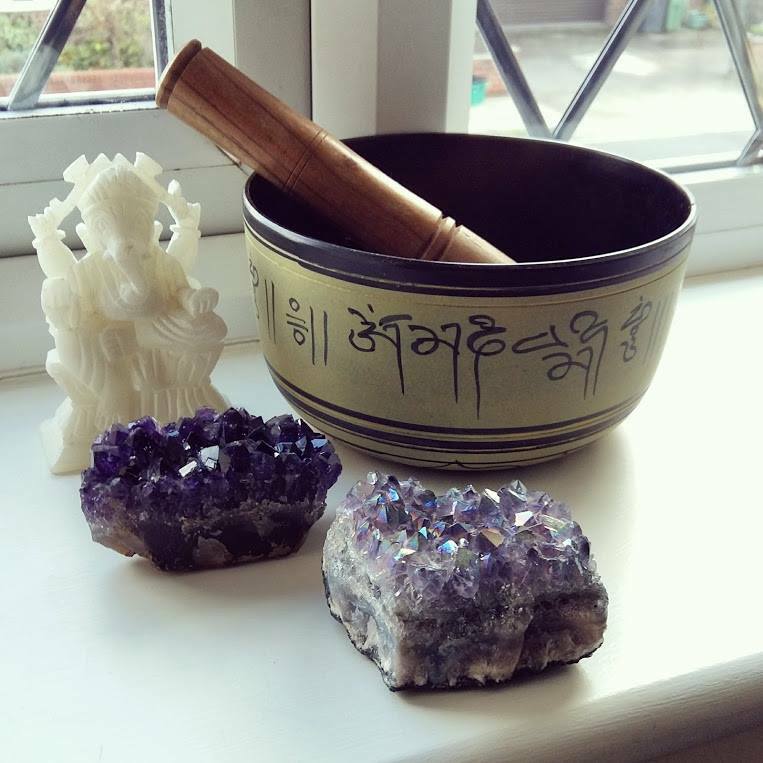 I’ve purchased a singing bowl now and wondered exactly how to use it properly as in will it cleanse all the crystals within a certain range of the sound? Also I’ve heard Tibetan bells can cleanse crystals too and wondered if this is true, as always thanks for all your invaluable information. Thanks for getting my book Donna. I believe that a Singing bowl will cleanse all items in a room, including your crystals. Yes Tibetan Bells/ Tingshas work the same way, though I prefer them for close range items. Hi Ethan! I recently purchased 3 of your books. They are what has been missing from my life. I’m currently devouring Crystals for Empaths and highly sensitive people. I listen to solfeggio sacred frequencies a lot via youtube. I was thinking that the solfeggio tones could cleanse my crystals. There are ones for cleaning energy from your home and I play it for hours near by crystals. What do you think about this? Thank you! Thanks so much Joanna, glad to hear you are enjoying the new book! I haven’t realy used those myself but in theory I do not see why it would not work. Is there a way to safely physically clean the crystals as in sanitization since they have been touched by a lot of people’s hands? I’m not sure about sanitising as most methods are harsh but I cover fingerprint/skin oils in my article about physically cleaning crystals.